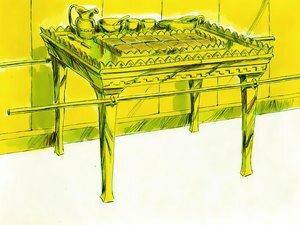 The holy place in Moses’ tabernacle was separated from the most holy place by the veil. 22. And he put the table in the tent of the congregation, upon the side of the tabernacle northward, without the vail. 23. And he set the bread in order upon it before the LORD; as the LORD had commanded Moses. 26. 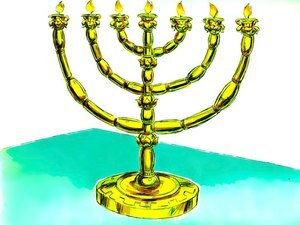 And he put the golden altar in the tent of the congregation before the vail: 27. And he burnt sweet incense thereon; as the LORD commanded Moses. 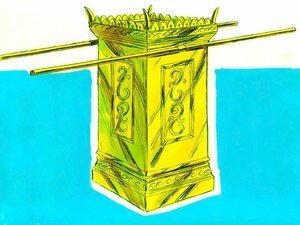 The set up of the Holy place is summarized in - Exodus 26:35 (King James Version) 35. And thou shalt set the table without the vail, and the candlestick over against the table on the side of the tabernacle toward the south: and thou shalt put the table on the north side. The priests went into the Holy place daily to carry out duties. Once per year on the day of atonement, the high priest would go from the holy place into the most holy or holy of holiest. When Jesus first left earth and went to heaven, He officiated in the holy place of the heavenly sanctuary.